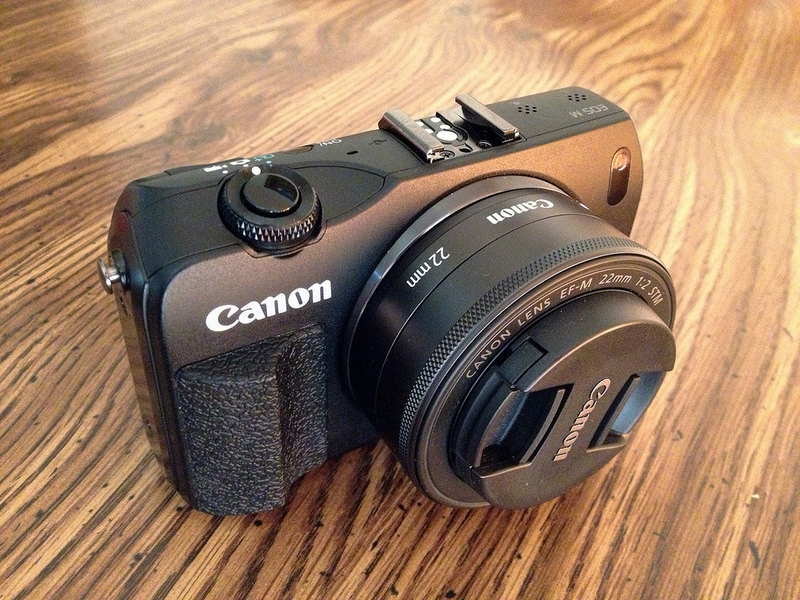 The Canon EOS M (mark 2) is a small, compact-sized camera with the ability to change lenses. Inside is a sensor very similar to the sensors found in Canon’s entry to mid-level DSLR range. That means you get the same picture quality as the DSLRs but in a very unobtrusive package that you can carry around all day and shoot without fuss. If you attach the 22mm lens, it’s a small enough device to fit into a jacket or coat pocket. The 22mm lens gives you a 40mm equivalent view (all those old street photos by Henri Cartier-Bresson were taken on 50mm lenses). A quick note on fixed-length lenses (like the one in picture above) versus zoom lenses. Zoom lenses are useful things to have, and you’ll have to decide what you want. But fixed-length lenses are often sharper and because it limits you forces you to think more, and if you want to zoom you’ll have to move your feet! Getting closer to the subject is important for a journalist. You’ll want the mark 2, not the first version of the camera, as the autofocus has been much improved. This camera has good colour rendition, takes nice looking photos with background blur and is quick and ready for action. It won’t be as fast focusing on moving subjects as a DSLR but the smaller size and lower weight might mean it’ll be taken out more. £300, including 18-55mm lens. The Canon S120 is truly pocket-sized. It’s smaller than most smartphones. But the sensor it has (which is relatively large for a camera of its size) means it’ll be far better in low light. This thing is incredibly easy to use, is great for snapping out and about, day or night, for a landscape photo, or portraits at a bar. It’s quick to shoot video, just press the dedicated button, and takes smooth and great looking videos, even at night. Two cons: if you’re taking lots of photos battery life only lasts about half a day. And photos can look a bit too smooth (as in the in-camera JPEG processing will smooth over people’s skin and background details). £260. This camera is the best camera for portraits. Often when you take photos for articles, it’s the people that are important, the ones you’ve interviewed or have some role in the story. This camera is optimised for that with great skin tones, great fill flash and colour correction for every kind of lighting condition. It also takes good street scenes and landscapes, although the colour won’t be as accurate and vibrant for landscape and nature photography as the Canons. It has a fixed lens so bear that in mind and it’s more costly than the other cameras featured, but it works great, has a large sensor, would probably work well for years and looks like a journalist’s camera. £869. 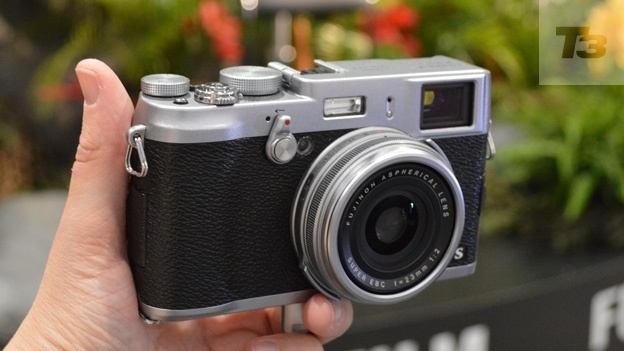 Consider the Fuijfilm X-M1 if you want to be able to swap lenses. Why is this cheap, plasticky thing better than the cameras above it? It’s simple. The sensors found in most compact digital cameras are actually very small. Basically, the larger the sensor the more information it can process, the better the low-light ability and more lower depth of field it can achieve. But this is for digital sensors which have become replacements for film. The usual size for film is 35mm. This size actually dwarfs most digital compact camera sensor sizes (like the Canon S120 shown above, or even the EOS M). To get the equivalent 35mm size in digital, what’s called “full-frame”, you have to shell out about £2000 for a camera such as the Canon 5D mk3. Which are much larger and heavier than the Olympus camera pictured. In other words, most film cameras have much greater low light and colour sensitivity than most digital cameras, because their “sensor” — each exposure of film — is far bigger than what’s available in digital cameras. Of course digital is more convenient, but if you’re on a more considered or more personal journalistic project, do consider film cameras. The one pictured costs about£50 in eBay and is noted for its accurate autofocus, sharp lens and smooth operation. You’ll have to do a bit of research on different film types, because they produce different tones, but the look and feel of the photos are different to digital. Most processing places are able to scan films too so you also have digital copies. The future-present The iPhone camera is still better than most Android phone offerings. I’ve written before on its use and application as a camera. Images taken with an iPhone, sometimes from conflict zones, like Libya, have graced the front page of Time magazine, published in major newspapers and magazines around the world. It is discrete, small, works brilliantly and takes photos. The important thing is it takes photos. What’s in them is still up to you. Advice – Choose based on how much weight you want to carry, how easy and unobtrusive it will be to take pictures, and how the camera will encourage you to take it up and shoot. Enjoyment is important. Why I didn’t include any Sony cameras – because they have poor colour accuracy, which is fine for Facebook etc, but not so great for publishing in a journalistic setting. Their colour profiles lean too heavy on the greens and yellows. Why I didn’t include any DSLRs – because they’re all pretty much the same now and they all work excellently and are all equally capable of taking brilliant photos. Any DSLR will work great. Tagged with best camera, Best cameras for journalists, best cameras for reporters, best journalism cameras, cameras for journalists, canon eos m, Canon s120, digital cameras, dslrs, film cameras, film cameras for journalists, fujifilm x100s, iphone photography, iphone photojournalism, journalism photography, journalists and photography, journalists cameras, most portable cameras, Olympus cameras, photography, photography for journalists, photography for reporters, photojournalism, reporting cameras, smallest best cameras, what camera should i get for journalism?, what is the best camera for a journalist? I have used the x100s for lanscape and scenery its actually decent. I love it most for journalism though especially when things start to go crazy like the ferguson riots. Oh really? I love the style of the X100s and how they must feel to take photos with. The lens on them is outstanding. How are the colour profiles of landscapes? For me, Canons are just a little truer to life…But I’m sure the Fujis do a great job too. How did you find using the X100 for the riots?? Was it an easy and unobtrusive camera to use? Especially as it’s a fixed lens.